Frank Zappa continues to challenge the boundaries of commercial music, producing an audio collage of breathtakingly fresh music, snippets of musique concrète, and dialogue from his unfunded movie. Recorded from September 1967 to September 1968 and released on April, 21, 1969, Uncle Meat is a particularly colorful album on a number of levels besides just the colorful dialogue included. Zappa aggressively and artfully deploys twelve-track recording and speed alterations to affect the timbre and character of voices and instruments, creating a clearly contemporary work not possible just a few years earlier. This is album is a barrel-full-of-monkeys fun to listen to with the highlights including the title theme, Ian Underwood’s keyboards and sax contributions, “Mr. Green Genes”, and the King Kong tracks on side four of the original LP. In 1969 and in the early seventies, I not only unsympathetically and almost unequivocally dismissed any version of a Beatles song not performed by the Beatles, but its accurate to say that I generally formed a dim view of any performer making such an attempt. And so my first impression of Joe Cocker was particularly negative when I heard his version of “With a Little Help From My Friends” on AM radio and later saw Cocker perform on television. Wisdom and time has helped me overcome this teenage bias, and as a musically mature adult, I actually respect anyone with enough nerve (or even recklessness) to do a cover of one of the Beatles classics. If they do it well, that is, they deserve my respect; looking back on Cocker’s rendition of one of the last of McCartney and Lennon’s true collaboration’s, “With A Little Help From My Friends”, and comparing it against Ringo’s vocals, I must admit that Cocker and his backing musicians pull this off pretty nicely. In fact, the whole album is pretty good, with some original tracks along with a diverse set of covers including the well-known and often recorded 1926 composition, “Bye, Bye Blackbird” as well as a couple of Dylan covers. Cocker and back-up singers team up with musicians as capable and as well respected as Albert Lee, Jimmy Page and Stevie Winwood, taking Cocker’s debut album as high as the thirty-fifth spot on the billboard chart. The Moody Blues continue with their signature style of music crafting an album that encompasses elements of the past, present and future: “To Share Our Love” harkens back to 1966 British Beat music, “Send Me No Wine” is country rock with an English accent, and “The Voyage” is an exploration into the territory of progressive rock. Recorded in the first two months of 1969, and released in the UK in April of 1969 and in the US in May of 1969, On the Threshold of a Dream quickly reached the number one spot on the UK album charts by May 4, 1969, staying there for a couple of weeks. There are some that would profess this to be the first progressive rock album to claim the number one spot, but to my mind that distinction either belongs to the Beatles’ 1967 Sgt Pepper’s album or ELP’s 1971 Tarkus, depending on how stringently one defines progressive rock. That said, it is a tribute to British taste how well this album did, particularly since its best mark on the US charts was the twentieth spot occurring the week of July 26, 1969. Though the Moody Blues is not one of my favorite bands, and one that I rarely listen to today, I am always impressed by their dreamy, evocative artistry that unfailingly creates a consistent, though often varied, mood — an enveloping, trademark mood providing a generally calming, mystical musical palette distinct from that of other bands of that era. Pay particular attention to the ethereal flute and oboe provided by Ray Thomas and the cello and mellotron contributions from Pinder, Hayward and Lodge. After the collapse of John’s Children, Marc Bolan hastily formed a new group to play at the Electric Garden club in Convent Garden, London, interviewing band members just a few hours before it was time to go on stage. The band was booed off, and Bolan dropped the bass and guitarist, keeping drummer, Steve Peregrin Took, and busking in the tube stations as an acoustic guitar and bongos duo, until, championed by famous DJ John Peel, they recorded their first album, which included John Peel reciting Marc Bolan’s prose on the last track of side two. Released on July 5, 1968, Tyrannosaurus Rex’s debut album, My People Were Fair and Had Sky in Their Hair… But Now They’re Content to Wear Stars on Their Brows, starts off with a basic blues number, a composition from Marc Bolan’s earlier days, but still sung with an authenticity hearkening back to blues 78s from the 1920s. It is after that point in the album, excepting another earlier song, “Mustang Ford”, that the duo of Bolan (assumed last name based on Bob Dylan) and Peregrin Took (yes, assumed last name from the novel, The Hobbit) embark on their own path, a concoction of folk, blues, and sidewalk musicianship that has an otherwordly, mystical flavor and just enough dissonance to make the music sparkle. Give some credit, also, to producer Tony Viscounti, for capturing the general spontaneous and naturalness of the duo, yet delivering a polished, finished product. Viscounti had been working as an in-house producer for the Richmond Organization which produced music by the Weavers, Pete Seeger, Woody Guthrie, Georgie Fame, and Anthony Newley as well as other folk and jazz artists. Just as one can hear some similarities with Anthony Newley on David Bowie’s first album, there are moments in this T. Rex album that are very much folk, with Viscounti working his magic to create a freshness, vitality and clarity to the music, keeping intact the beauty of the acoustic guitar through this wonderful album. All tracks written by Marc Bolan. Recorded on July 2, 1968, Charles Tolliver first album as a leader, Paper Man, seems to be one of those overlooked gems of jazz, not easily available today as a CD or LP, though accessible via Amazon streaming or downloadable from Amazon as mp3s. Tolliver is supported by pianist Herbie Hancock, bassist Ron Carter, drummer Joe Chambers and, for part of the album, altoist Gary Bartz. Herbie Hancock is particularly inventive, providing diverse accompaniment and soloing, and Charles Tolliver sounds great! The title track, perhaps intended for radio air play, is the most conservative, and potentially most commercial of the tracks and ends the album, with the first five tracks all being more adventurous and compelling. 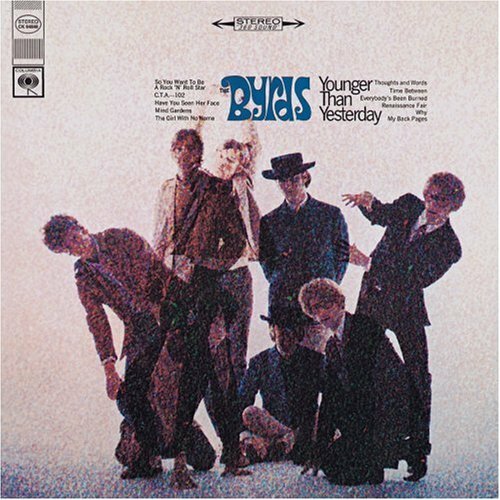 The production quality of this album is very good for 1968, with clear definition of Joe Chambers’ excellent drum work on the left channel and Hancock acoustic piano on the right. Well worth the effort to track this down, and an album that deserves repeated listening. Recorded mostly in the first five months of 1968 and released on July 3, 1968, this third Doors’ album continues along the same path as their second, however with all but one of Morrison’s cache of original material previously recorded, Morrison and the band had to rush to come up with new music. Initially, the were going to include a composite piece of earlier Morrison fragments (a version of this can be heard on side four of their live album released two years later), but for whatever reason this was abandoned. The hit from this album “Hello, I Love You”, was written by Morrison a few years earlier, and was previously recorded in 1965 with an earlier version of the band named Rick & The Ravens. 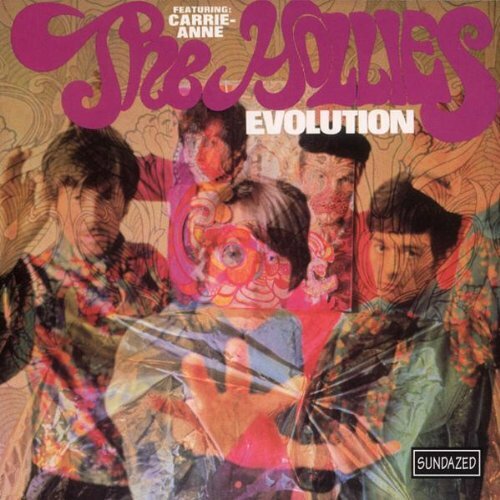 This 1968 version was promoted as the first rock single released in stereo, and it climbed to number one on the pop charts in both the U.S. and Canada. All tracks written by The Doors (Jim Morrison, Ray Manzarek, Robby Krieger and John Densmore), except as stated. Rock was a child of many parents including Rock and Roll — and Rock and Roll was mainly the child of rhythm and blues, but often with some country thrown in, absorbed, stolen, or otherwise incorporated. One permutation of the more traditional rock-and-roll and blues-based rock music family offshoots that had been influenced by country music was what would later be labelled Southern Rock. In contrast the progressive exploration and aggressive, rebellious pushing of the envelope taking place in 1968, we see an opposite trend in Southern Rock: a more conservative approach to music generally using a limited set of chord progressions, reverting back to a more homophonic or chordal texture, with solo guitar lines providing a large portion of the musical contrast or musical interest. Amazingly enough, two of the early commercially successful representatives of this style were a California band sounding as if they had come from Louisiana, and a Canadian band that had first provided backup in Toronto for Arkansas-born Ronnie Hawkins and then later served as Bob Dylan’s touring rock band. 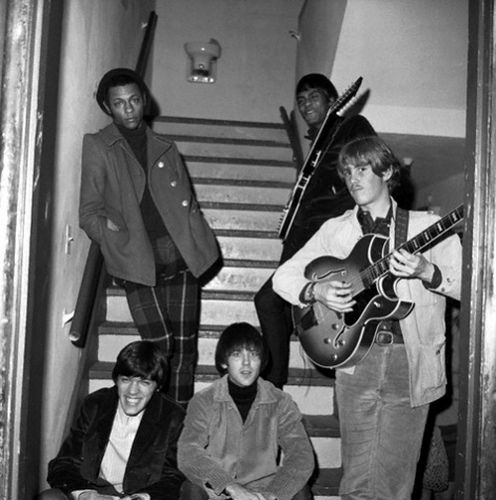 With their three youngest players, including John Fogerty, together since their junior high in Los Cerritos,California, and the fourth being John’s older brother, Tom, who they soon joined up with, the Blue Velvets, played basic rock and roll, eventually signing up with Fantasy Records in 1964, with the unfortunate name of The Golliwogs being thrust on them — which, thankfully, was changed to Credence Clearwater Revival when Fantasy Records changed ownership. 1960’s rock and roll, blues, rhythm and blues, and country music all contributed components to their first album, titled after the name of the band. And though this is not the type of music I turn cartwheels over, I have to admit it is pretty good. John Fogerty’s guitar solos are interesting, the production of the album provides clear distinction of the basic rock instruments of drums, bass, rhythm guitar and lead guitar, and music is well crafted and well performed. The album provided three singles for airplay, including”Suzie Q”, a “swamp-rock” classic originally recorded and co-written by Dale Hawkins in Shreveport, Louisiana in 1957. The remaining tracks are also interesting, with the bass and rhythm guitar on the last track, “Walk on Water”, a remake from the earlier days as the Golliwogs, being particularly notable. It’s easy enough to forget how much bad music was on the AM airwaves in 1968. When we ask a streaming music assistant like Alexa to play music from the 1968, the fare provided is generally some of the better music, the classic tracks, the music that has survived the more critical scrutiny that occurs over time, as opposed to some of the least palatable numbers that found their way to the charts and on to the portable turntables of some of the teenyboppers that had lesser developed musical tastes. One of the many annoying singles in 1968, was “The Weight.” Listening to this again in 2018, I still cringe, despite the high audio quality of the track on the Mobile Fidelity SACD release of The Band’s debut album, Music from the Big Pink. Listening to the album as a whole, I hear much that is good, but nothing that excites me musically. I realize that this album is considered a true rock classic by many, and though I don’t deny its historical influence, I don’t particularly celebrate that influence either. To my ear these songs seemed to have started with a sequence of chord changes, fairly ordinary chord changes, on which lyrics where imposed with the melody derived from the meter of the lyrics and the underlying chords. Or perhaps, the lyrics were written first in some cases, perhaps in the case with the three Dylan songs on this album, and the music was something provided to support the lyrics. However, this was put together, it doesn’t strike me as carefully crafted final set of music and lyrics, but something produced from the output of a series of casual jam sessions consolidated into shorter songs. That first CCR album and this first album by The Band, along with a few other albums of 1968, such as the August 1968 Byrds album, “Sweetheart of the Rodeo” and the two 1968 albums by Canned Heat, are early examples of country rock and more blues-based rock bands that would become more popular and prevalent in the 1970s, possibly as an alternative to the apparently less-accessible and more complex progressive rock that it would co-exist with. One should also consider the influence of The Grateful Dead, Country Joe and the Fish, psychedelic rock, blues rock and hard rock on this genre. As always, pasting labels on music is perhaps effective for display or marketing purposes, but does little to further the enjoyment or understanding of such music. Never let anyone else’s opinion of something influence your innate desire to explore the vast expanse and richness of music left to us by previous or current generations of composers and musicians. This debut album by the Southern California group, Overcast, recorded in January of 1968, and released prematurely on April 1, 1968 prior to any marketing effort or activity, due to a simple clerical mistake, sold less than 800 copies, many of which were purchased by family, friends and, even though they were given several gratis copies, band members themselves. It was first re-released in 1989 as a CD and later pressed on 180 gram vinyl as a limited edition LP; one can also find one or more tracks included in various compilations and box sets. Bill Fortney was born in Whittier, California, and moved to La Mirada in 1959 at the age of 11, learning guitar from his uncle, who being intermittently unemployed, lived on and off with his sister, Bill’s mother, and her family, giving guitar and piano lessons to neighborhood children and, on occasion, playing studio gigs recording unaccredited guitar work for technically deficient rock guitarists or providing short passages of acoustic or electric guitar for lower budget movie soundtracks. The young nephew never took a liking to the piano, there was none in the Fortney home, but, instead, Bill spent hours upon hours playing all three of his uncle’s guitars until his father bought him an inexpensive nylon-stringed acoustic guitar for his 15th birthday and then a second-hand scarlet-red Vox Clubman electric guitar for his 17th birthday. The album opens up with the bass-dominated instrumental “Weather Endeavor” which is primarily blues-based except for a psychedelic middle section in which Douglas Brandt’s friend, Rick Stephenson plays saxophone against Fortney’s wailing, Hendrix-influenced guitar. In this middle section, the band modulates from C major to D major with a ensuing mish-mash of major, minor and dominant seventh chords until a sustained half-diminished seventh-chord on B precedes a decisive return back to C major for a heavily modified A section rampant with chord substitutions. The result, though adventurous and unusual, comes off more unfocused than artful. This is then compensated for by the second track, “Action Reaction”, which is a simple three-chord riff-based rocker, with Brandt’s bass conspicuously emphasized and borderline decent drum work from David Amato. Side one closes out with “Please Plead Plea”, a sorrowful lament entreating the love interest of the song to apologize for past wrongs and beg to be taken back. Again Brandt’s bass stands out with Fortney’s electric guitar imploring and beseeching throughout. Side two opens up with “Fifth Tuesday of March” which is similar to the Kink’s “Love me ’till the Sun Shines.” This track is followed by “Sawdust and Certainty?” with marimba and organ contributing to a song full of contrasts, the music vacillating between contending against and partnering with decidedly opaque and impenetrable lyrics. The third song of side two is “Sampson and the Philistines” a musical sermon against giving into the establishment, cutting one’s hair and becoming blind to the evils of the military-industrial complex — especially when this is done for the sake of landing a summer job. The album ends with “Electrical Connection”, apparently an attempt to create something akin to The Door’s “Light My Fire”, though clearly falling short commercially and artistically. Claire Stanston proves effective on organ, and, once again, we have Rick Stephenson on tenor saxophone and some notable guitar work by Fortney. All tracks written by Bill Fortney and Douglas Brandt except where noted. Is it possible that the first truly progressive rock album was not a rock album, but a jazz album? For those that adamantly insist that the most adventurous and exploratory rock music of 1967 and early 1968 is really not progressive rock but “proto-prog, such prog fundamentalists often require that any music to be considered true progressive rock must display a relatively high level of musicianship and deploy mixed meter or unusual time signatures, 20th century instruments, a wide range of dynamics and instrumental combinations, effects such as tape loops or use of quarter tones, and extended length tracks painting a colorful, sonically rich landscape. If we buy into such requirements, then perhaps we should consider this modern big-band jazz album recorded in September 1967 and released either in late 1967 or early 1968, to validly qualify as the first progressive rock album. In terms of quality and excitement, The Don Ellis Orchestra’s “Electric Bath” should please any “Close to the Edge”, “In the Court of the Crimson King”, “Thick as A Brick”, “Selling England By the Pound”, “Brain Salad Surgery”. or “Power and the Glory” fan. A progressive rock album has to start with a fervently vigorous or otherwise bigger-than-life immersive track such as King Crimson’s “21st Century Schizoid Man”, Genesis’s “Watcher of the Skies”, or the opening to ELP’s Tarkus. “Indian Lady” is just that with its fanfare opening, a meter of alternating 3 and 2, and a strong distinct theme running relentlessly forward, swinging ferociously with a indisputably bluesy orientation. We also have sitar, electric piano, and most notably, Don Ellis on a four-valve quarter-tone enabled trumpet. The second track, “Alone”, by far the shortest at less than six minutes, is a basically a samba, a musical form from Brazil that became so popular in the mid sixties, but in 5/4 time without any sense of awkwardness, but just the opposite, fully liberated and unconstrained. Ending the first side is the brilliant “Turkish Bath” with sitar and a exotically distorted reeds sounding not so much like instruments from Turkey, but from an even more exotic location, probably from another planet in some remote solar system. Sitar and quarter-tones contribute to the appropriate balance of spices. “Open Beauty” open side two of the original LP, and provides appropriate contrast and musical reflection. Elegantly executed by the band, this composition is haunting, surreal and evocative, with ebbs and flows of intensity until a little over two-thirds of the way in when we get a tape-delay Don Ellis solo which initially echoes with layered fifths and then more adventurously explores into more expressive and polyphonically combative territory. The last track, “New Horizons” is the strongest, longest and most remarkably inventive of the album with relentless energy driven by a 17/8 5-5-7 pattern with amazing ensemble and solo trumpet passages. The work unfolds like a story with contrast and subplots ending with explosive energy winding down into an emphatic, punctuated coda. This album should appeal to anyone that loves adventurous and well-written, arranged and performed music whether their preference is classical, progressive rock, progressive heavy metal, be-bop or big band jazz. in 1968, I went, along with some other junior high school friends to another friend’s house where his dad greeted us by playing us Tchaikovsky’s 1812 overture on, what to most junior high students at that time, was a pretty impressive stereo system. I had had rather limited exposure to classical music at this point, never having been to a classical concert, and only having heard a few complete classical pieces like Ravel’s Bolero, Gershwin’s Rhapsody in Blue and Rimsky-Korsakov’s Scheherazade on a limited-fidelity monophonic system. To hear this Tchaikovsky work not as a snippet in a television commerical, but from start to finish in full stereo, with horns and, ultimately, cannons, commandeering the empty air space around us, left a impregnable impression not just for that day, but the rest of my life. This album doesn’t have the cohesiveness of “Sgt. 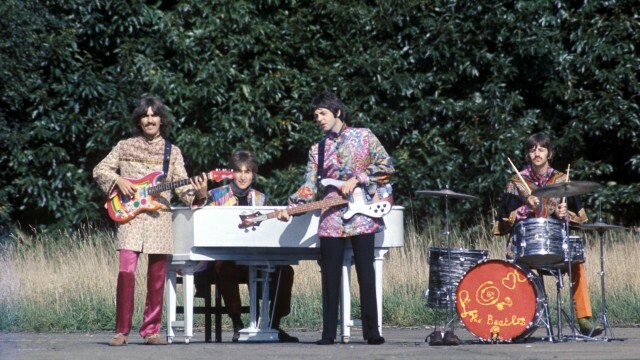 Peppers” or the second side of “Abbey Road, but the presence of “Strawberry Fields” and “I am the Walrus”, perhaps the only two songs of 1967 that are on par with “Lucy in the Sky With Diamonds”, is enough to make this album essential. There is also the post-summer of love anthem, “All You Need is Love”, which extended the momentum of the love movement for at least an additional eighteen months. George Harrison contributes the psychedelic and eastern influenced “Blue Jay Way”, one of those amazing tracks that we see so often on 1967 albums (for example, see last week’s post on the Byrd’s song “Why”) that solidly sound Indian influenced and yet does not contain a single sitar or other traditional Indian classical instruments. 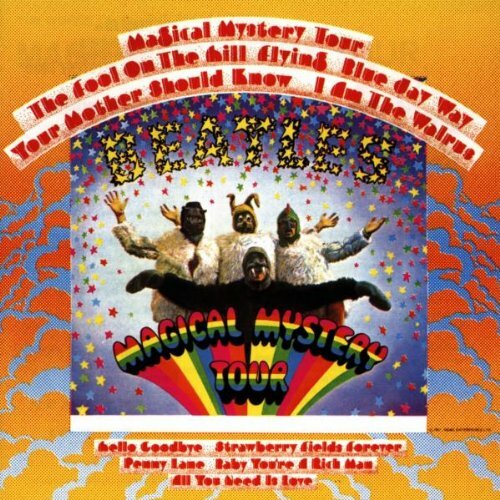 This week marks the fiftieth anniversary of the release of “Magical Mystery Tour” on November 27, 1967 in the US, an album which sold a little under two million copies in the first 30 days of it’s release. Formed in 1964, in Los Angeles California, the Byrds are generally, with the advantage of retrospect, considered one of the more essential and influential bands of the mid-sixties, primarily due to their blending the rock style of the British Invasion with elements of country and western music, folk, west coast rock and psychedelia. Both albums have their annoying, overly-commercial, teeny-bop elements (think of what you dislike about Herman’s Hermits) but this is compensated by the inclusion of several excellent tracks. Lot of the credit for what is really good here goes to Graham Nash. At this point the reader probably sees where I am going with this post — covering the Byrds, which had David Crosby writing some of their best songs, the Hollies, with Graham Nash writing some of their best tunes, and next, Buffalo Springfield, with Neil Young and Stephen Stills — these four guitarists/singers/composers forming Crosby, Stills, Nash and Young. It’s time we stop, hey, what’s that sound? Mostly say hooray for our side! It’s s time we stop, hey, what’s that sound? You step out of line, the man come and take you away. Stop, now, what’s that sound? Stop, children, what’s that sound? 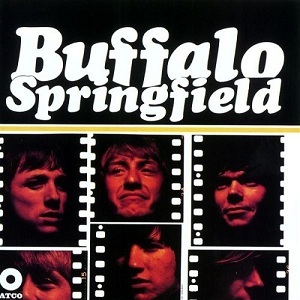 This is clearly Stephen Still’s masterpiece of his career and was of such impact that ATCO, the album’s label, re-released this first Buffalo Springfield album in March 1967, including this track. For this reason, its fair game to consider this album belonging to 1967. This is an album that was pretty much ignored in November of 1967 when released on the Elektra label. 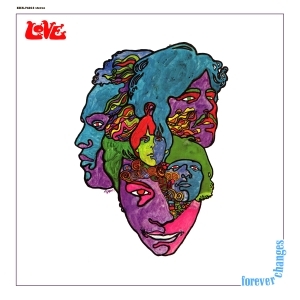 This is the third and final album of a Los Angeles based group called “Love”, though this really is mostly the work of Arthur Lee, singer/songwriter/guitarist, with a couple of songs contributed by Bryan MacLean, another member of the group, the rhythm guitarist, who provides leads vocals on compositions. From the start, with it’s acoustic opening, there is an intimacy to the album with its well-crafted and fresh-sounding arrangements. There are elements of the west-coast rock sound of 1967, folk-rock, and interestingly, English rock: it shares some characteristics found in the 1967 Moody Blue’s “Days of Future Passed”, Genesis’ 1969 album “Genesis to Revelation” as well as sharing some stylistic traits with The Who and The Kinks. That said, this is an original, very much non-derivative album that holds up well under repeated playings. Hailed by some as one of the great masterpieces of 1967, this is an album that anyone that loves late sixties rock or loves what is often called “proto-prog” should check out, even if it doesn’t end up being one of your top 10 or even top 40 albums of 1967. All tracks written by Arthur Lee, except “Alone Again Or” and “Old Man”, by Bryan MacLean.